Early November is one of my favorite times to be in Mexico. It's fiesta time "south of the border," as residents give vent to an ancient celebration known the Dia de los Muertos (Day of the Dead). A country with roots deeply entrenched in ancient Indian and colonial Spanish cultures Mexico's unusual celebration coincides with Halloween in the US. The ancient peoples of Mexico were obsessed with death and believed that it was necessary to die in order to be born again. To guarantee this rebirth, they set aside two months in which to honor those who had gone before them. The ninth month of the Nahuatl calendar was dedicated to children; the 10th to adults. During this celebration, human sacrifices were made to insure the flow of fresh blood, so vital to regeneration. Abundant offerings were laid beside the sacrificial stone, as young men attired in feathers and jewels gyrated around it to the beat of Nahuatl music. Although this was basically a solemn occasion, it was fiesta time in the Aztec world and a good excuse to drink pulque (a potent brew made from cactus). The evolution of the Aztec empire was cut short by the Spanish conquest and it was not difficult for the conquering priests to persuade the recent converts to shift their months of the dead to a two day celebration, known as All Saints and All Souls Day. The meshing of pagan and Catholic rituals which resulted formed an interesting tradition in Mexico which lingers to this day. 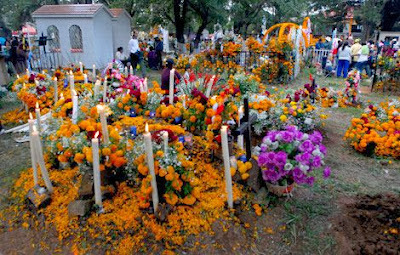 On these two days, everyone feels morally obligated to go the cemetery to honor their dearly departed and convivir (spend time) with them and in true Mexican style, a social happening takes place. Typical Mexican dishes are reverently prepared and toted - along with several bottles of the preferred drink - to the gravesite. Tombs are decorated with the flower of the season, the pungent tzempazuchil (marigolds) revered by the Aztecs and candles and incense are laid around the grave. Once the stage has been set, the gathering begins around midnight with prayers, ending in the wee hours of the morning with drinking and raucous toasting to the “continued good health” of the deceased. Though this rowdy practice has been banned in many cemeteries, it has become a tourist attraction in some parts of Mexico. In Mizquic, along the southern outskirts of Mexico City, or on Lake Patzcuaro’s island of Janitzio, in the state of Michoacan, worship of the dead with all its pageantry is alive and well. 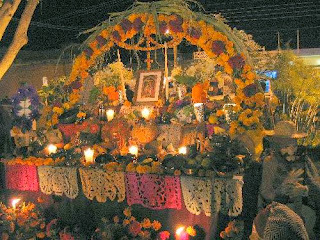 In many towns, the homage takes place in the home, with altars festooned with flowers and photos of the late loved one prominently displayed. On the November 1 feast of the children, a large table is laid out, laden with offerings of flowers, fruit, candied pumpkin water, toys and candles. These gifts are left out all night so that the spirit may partake of the “essence” of the offering. The following morning, the “leftovers” are consumed by the family, with the thought that they have shared a meal with the missing family member. A hardier meal is set out on November 2 in anticipation of the adults with additional treats, such as pan de muerto, a sweet, doughy bread with crossbones emblazoned on its crust, added to the menu. Flowers, candles, incense, a bottle of tequila, if he enjoyed a nip, or a pack of cigarettes if he smoked (even if this was what killed him) are carefully set out for the “visitor." Small death figures made of marzipan, gruesomely fashioned for the ritual are the highlight of the feast. Skulls with the names of the living etched on them, and skeletons decked out as brides, soccer players, musicians and beggars complete the bizarre scene. According to ancient tradition, eating these macabre confections is the Mexican’s way of laughing at death and proving that he does not fear it - a macho act of sorts. 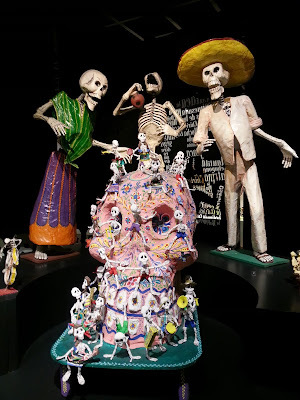 Another common way of celebrating the Day of the Dead - and the most palatable - is with calaveras or witty poems and epitaphs penned for relatives, friends, or celebrities who are still among the living. These written or drawn eulogies were made popular at the turn of the century by Jose Guadalupe Posada, a political satirist. Today they are used mainly to poke fun at friends, or to mock the Grim Reaper. Mexico City’s popular Bazaar Sabado boasts one of the best Dia de los Muertos displays, amid its delicately fashioned arts and crafts. Ignacio Romero, founder and director of the Bazaar fights to keep Mexican tradition alive and does so with a brilliant display of marigolds and fiery decor. 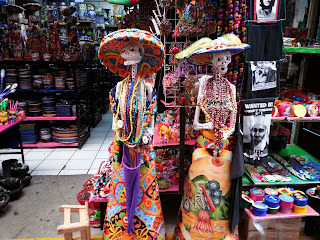 Multi-colored candles line a long table brimming with tamales, tacos, pan de muerto, fruit and candied pumpkin as well as jugs of tequila and pulque. 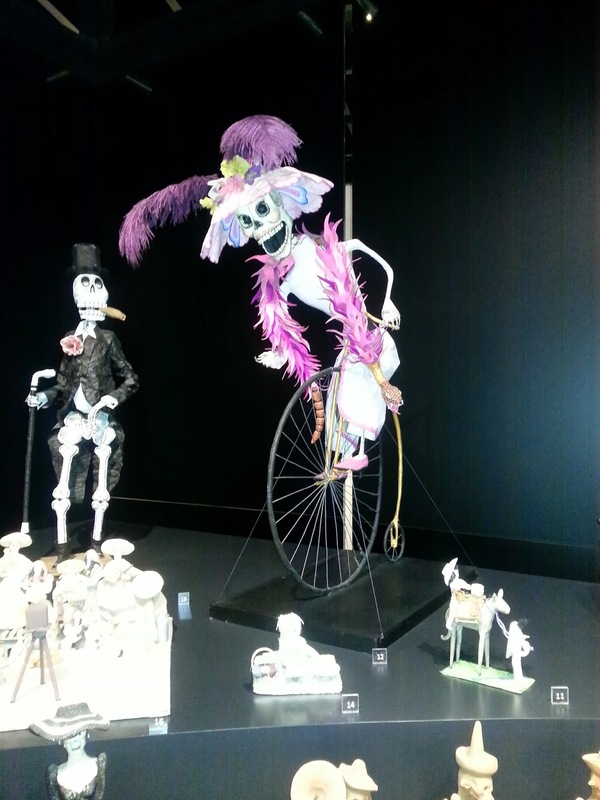 Carved wooden skeletons masquerading as a ghost orchestra face off with sugar skulls, each with the name of one of the Bazaar’s employees etched into it. At the end of the festival, the employee eats the skull bearing his name - another act of defiance. 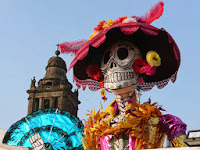 Mexico’s fascination with death is legendary and although the celebration is beyond the comprehension of most outsiders, the event is an interesting one to observe. Whether this is just another excuse for a party, a way of discharging the soul, or merely a show of machismo, there is no doubt that death takes a holiday in Mexico each November. I love Dia de los Muertos! It's one of my favorites, too. Hope you enjoyed the article!